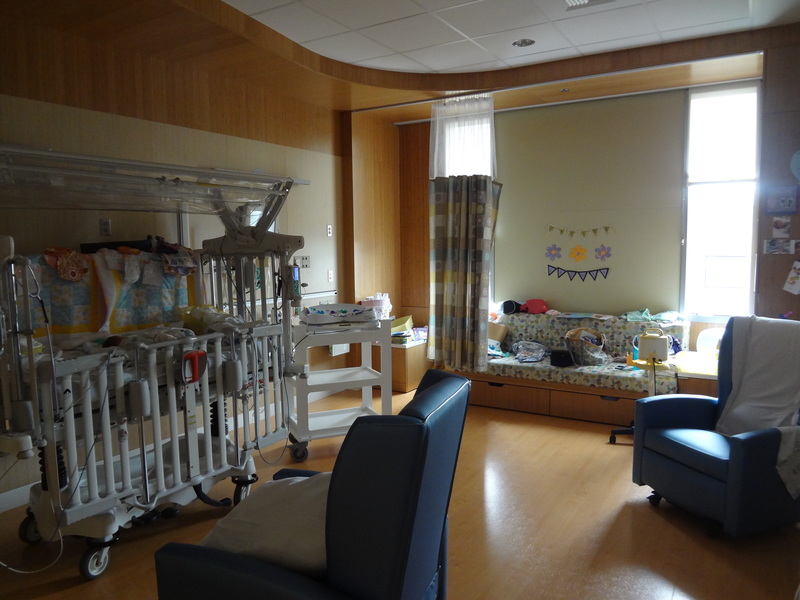 Sylvia and Carina’s first home: their room in the NICU. Last week was my due date. I can’t help but wonder what today would have been like if my babies had stayed where they belonged. I would have been gloriously uncomfortably pregnant leading up to their birth. I would have wistfully said good-bye to pregnancy forever. And I would have been able to hold my babies on their birth day, breathing in their brand-new baby smell, counting their tiny fingers and toes, kissing their round cheeks. That wasn’t how it happened, but I still feel like the luckiest mother in the world. 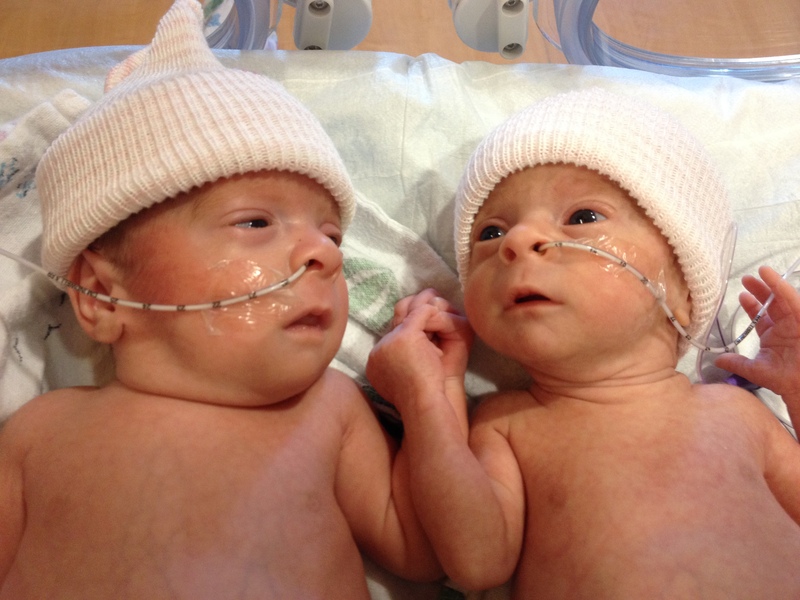 Sweet little Sylvia and Carina are ten weeks old, born ten weeks early. But they are here, and healthy. And they are finally HOME! I started writing this post two weeks ago but haven’t had a moment since to finish it. Carina came home on September 29th, quickly acing all her NICU exams and surprising us all by how quickly she was ready to go, especially after her rocky start. The day before, T and I frantically raced around the house getting everything ready and trying to find space in our tiny two bedroom condo for two babies. At the NICU, the nurses pulled off all Carina’s probes and handed her to us. It felt amazing and strange to hold my daughter for the first time without wires. We packed up her half of the room, and buckled her into her car seat. It all felt very surreal. Our littlest daughter was sleeping soundly in her industrial NICU bed when we left. I kissed her goodbye and started to cry. It felt wrong to be taking her twin home and leaving her behind, so tiny and lonely in that big cold bed. All the raw emotions from leaving my babies behind in the NICU the first day coming back to the surface. Over the next two and a half weeks, we juggled twins in two places, carting Carina back and forth to the hospital to visit Sylvia and pleading with Sylvia to take her feedings so we could take her home. Carina was not pleased to be back in the hospital; my easy-going baby would cry every time I put her down in the NICU bed. I would kangaroo with them both together as often as possible. Sylvie loved this most of all- reaching her arm over her sister in a hug one day as I held them together. At home, I would call the NICU night nurse on duty when I was up with Carina in the middle of the night, checking in to see how Sylvie was doing. The hospital had moved Sylvie out of her delux twin room to a smaller single baby room, with a whole new set of nurses. So now when I called to talk to the nurse at night, most of the time I was talking to a stranger, someone I had never met who had the job of taking care of my littlest baby. I’d tell them to be patient with her, that she was a slow eater but that she could finish a bottle if they stuck with her. I could tell that some of the nurses took my pep talk to heart and did their best to get Sylvie to eat. But others were eager to get me off the phone so they could just turn on the tube feeding instead of bothering with bottle feeding my slow-poke eater. Until Sylvie could take 75% of her feedings by bottle, she wouldn’t be able to come home. So the days clicked away, and it seemed Sylvie would never be able to come home. 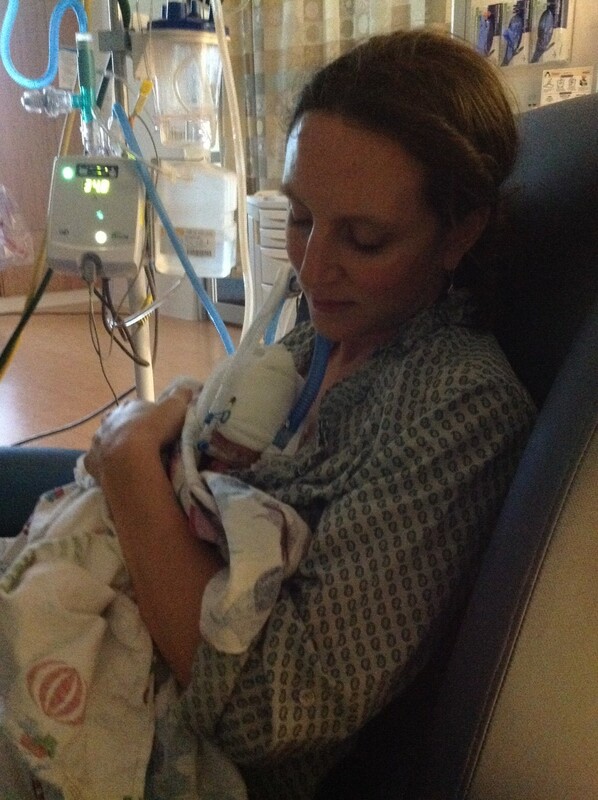 Finally, last Wednesday morning, Sylvia’s NICU doctor called. She’s the one who was there the night the girls were born. The one who saved Carina’s life. “YES!” Yes, I wanted to take my baby home! I called T at work to give him the amazing news, and we made arrangements to meet at the hospital at the end of the day so we could all leave the NICU together as a family. As I drove over the bridge to the hospital one last time (at least until all the follow-up appointments) I exhaled a giant sigh of relief. We had made it through to the other side. After so many months of anxiety and uncertainty, both my babies would be home. They were going to be ok.
We packed up Sylvia’s room and at the urging of our nurse, took a “Victory Parade” around the NICU to say goodbye to everyone. I tearfully hugged my favorite nurses goodbye, overwhelmed with gratitude. As I stood in the lobby of the hospital, waiting for T to bring the car around, a woman came over, curious about the double stroller and its occupants. The question stumped me for a moment. I didn’t want to explain it all. Everything I’d been through. Everything they had been through. My babies were nine weeks old, but they were also 39 weeks old. Not even to their due date yet. I gave her the short explanation. Her question, well-meaning if nosey, pierced my heart, as I recalled how small and fragile my two and three-pound newborn babies were. How close I came to loosing them. I tried to answer her, but started to cry. “Very, very small.” I managed to say. T came around with the car and we headed home, stealing glances at our beautiful babies in the back seat, marveling at how lucky we were. In the days since then, that sense of wonder hasn’t waned. Even with the sleepless nights, waking up to feed two babies every three to four hours, I hold the girls close and whisper to their sweet baby heads how loved they are, how grateful I am that they are with us. They already have. So grateful. The bridge from home to the hospital. Every time I drive over the bridge to the hospital , I flash back to that terrible night on July 10th when T and I first made the trip there. Checking in at 25 weeks, answering “October 22nd” when the charge nurse asked my due date- a date that seemed so impossibly far away. Hearing the worst-case scenarios from the neonatologist and MFM teams. And then the five harrowing weeks of hospital bedrest that followed, each day wondering if that was the day my babies would be born too early. Then my daughters’ terrifying birthday on August 12th. Meeting Carina for the first time, holding her tiny hand in mine and hearing from the doctors that this might also be a good-bye. That I should prepare for the worst. Leaving the hospital for the first time, the heartbreak of coming home without my babies. All the days driving back and forth over that bridge since then to visit them. Each night going back across the river, leaving them behind again and again. It all has taken a toll. But my tiny girls are amazing. And tomorrow, at 36 weeks and 5 days, against all the odds, Carina is scheduled to come home. She had her feeding tube removed and has been taking all her feedings by mouth. She’s passed her car seat test. She hasn’t had any destats or bradys (heart rate or breathing episodes) for over a week. The hard part is that tiny Sylvie isn’t ready yet. She’s healthy and growing and alert, but she’s not interested in nursing or bottle feeding yet. She’d rather snuggle into my arms and sleep, or look around the room with her wide eyes, taking it all in. The bottle or the breast just getting in the way of her view. I had dreamed of a joyful and triumphant homecoming with both my babies, but instead I’ll be leaving Sylvia behind again- all those feelings I had leaving her the first day home coming back again. So it’s a beautiful terrible mix of emotions. The joy of welcoming home the daughter I feared I might have lost. Showing her the world outside the hospital. Tomorrow night I’ll get to snuggle her whenever I want, without having to ask permission from the nurse. But our family still won’t be together. Hopefully her sister will follow soon. And maybe one day I’ll drive over the bridge with my three daughters singing and cooing and talking in the back seat, and the old terrifying memories won’t engulf me. Instead I’ll think about how strong we all were to get through this. How happy the days have been since then. And how grateful I am to be on the other side. Taking on the big world together. The girls have been proclaimed adorable by their nurses and “boring” by their doctor which is as good as it gets in the NICU. Both girls are off all oxygen and respiratory support systems, and now only have the feeding tube as the last thing to vanquish before they can come home. Each time a piece of support equipment is removed from the room- oxygen and nitric oxide tanks, the CPAP breathing support with the tanks of bubbling water, the jaundice lights, the IV rack, the high flow canula- I relax a little bit more. The monitoring machines in the room no longer beep angrily and urgently every few minutes. If I dare say so, it’s actually peaceful and calm in their room now. They had their eye exam last week for ROP (Retinopathy of prematurity) a condition that causes vision problems in preemies. (ROP is the reason Stevie Wonder was blind.) The doctors use a tool like metal pliers to keep the babies’ eyes open- ugh. Other NICU moms recommended that I leave the room for the exam since it’s so tough to watch. I took their advice, reminding myself that the babies won’t remember these traumatic days but I will- and I should spare myself these bad memories if possible. The nurse came out less than ten minutes later, letting me know the girls were done and had hardly complained. And the good news that the exam came back normal. Another sigh of relief for mama. The girls are so much happier now. When they were first born, they were so very angry, screaming until their faces turned red and then blue as they tried to pull off their CPAP masks, pulling on the wires. It was scary and heartbreaking to see. Their early arrival to the world had been a cruel one with so many needles and pokes and prods, bright lights and loud alarms. Now they smile in their sleep, only being awakened for their diaper changes and to try and convince them to nurse. After weeks of sleeping in their separate isolettes, they also get more time together now, taking their first bath together and snuggling together in the same bed occasionally. We put them side by side after their first bath, and they reached up and grabbed hold of each others’ hands. As if to say, it’s a big world out there, but I have my twin and we are in it together. I love seeing them together. Hopefully it won’t be too much longer before I can see them together every day- and not have to drive to the hospital to see them. A double armful of love- with my August instead of October babies. It’s the unofficial end of summer, and it feels like summer never happened to me at all. Spending the first five weeks at the hospital on bed-rest, and then going back and forth to the NICU for the past three weeks, my memories of summer of 2014 will be linked forever to the smell of sterile hospital rooms and hand-sanitizer, the sound of beeping of monitors and the feeling constant anxiety. The anxiety is lifting a bit now. Carina and Sylvia are doing amazingly well, especially considering Carina’s terrifying start and the dire words from “Dr. Doom” on their second day who unhelpfully said that the girls “aren’t doing as well as he’d expect for their gestational age.” He filled our heads with all kinds of worries, so much so that T and I stopped asking him questions and would try and avoid seeing him as much as possible. The nurses and doctors since then have all been impressed with the girls’ progress and hopeful about their future. Even as tiny as she is, Sylvie hasn’t needed the dreadful CPAP for a while now. Carina graduated from the CPAP last week, and now is on just a “whiff” air pressure from the high flow canula. Dr. Amazing, who saved Carina’s life the night she was born, told us today that she expects Carina would come off the canula in the next day. The IVs are out now too, so both girls will only have the feeding tube until they are bottle and breast feeding 70 percent of their calories. They already are over their birth weights; Sylvie is closing in on 3 pounds and her big sister is almost at 4 pounds. Being able to see the girls’ sweet faces without the CPAP gear makes such a difference. T and I finally feel like we are getting to know them, to see their expressions and features as we never could with their heads covered with the CPAP hats and tubes. The girls are happier and sleeping better now that they don’t have all the tubes in their noses and gear on their heads too. 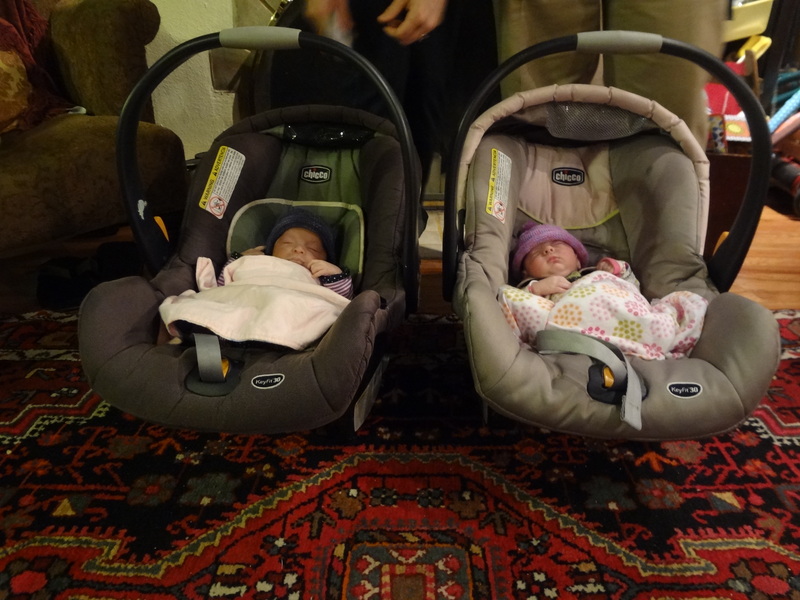 With the CPAP gear off, we were also able to give the twins their first baths. They both loved it, relaxing into the bath water as if it were the home they should still be in at only 32 weeks. And best of all, we now can hold both girls together. The moment I first held both Sylvie and Carina in my arms together, my heart filled with such love and relief, seeing their little heads side by side. Carina slept soundly as usual, while Sylvie reached out for her sister and inched closer to her just as she had in the womb. For the first time, it finally felt real that I was the mother of twins. We still have a long way to go before they can come home, but knowing that they WILL come home is all that matters. When I worry, T reminds me how far we’ve all come- and how tough our girls are. Once again it’s just one day at a time. It’s been nine days since the girls were born but it feels like several lifetimes. Physically I’m feeling well, considering five weeks of bedrest followed by the c-section surgery. But emotionally, I’m still reeling from the girls’ sudden and traumatic birth. 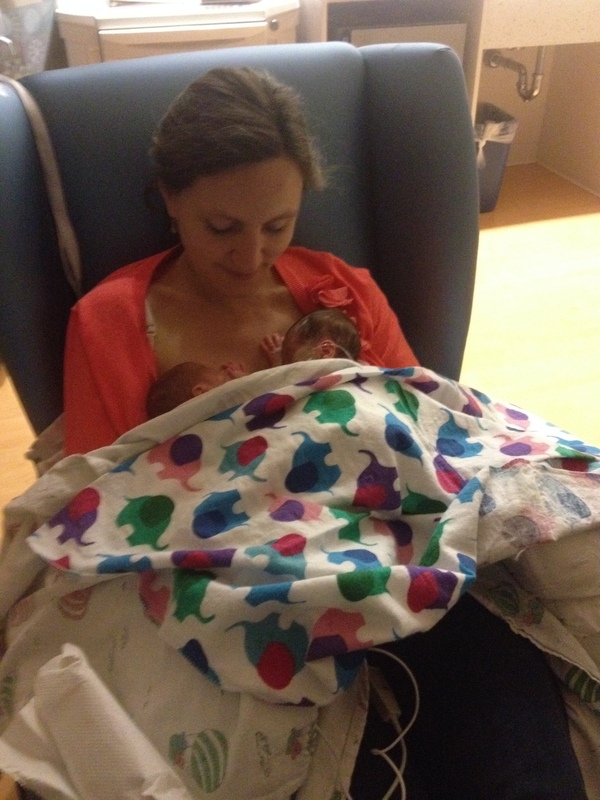 T and I run back and forth to the hospital, trying to be there for all the c-Pap changes (the one time a day we can see their sweet faces under all the headgear that helps them breathe) and trying to fit in all the “Kangaroo Care” snuggle time that we can get. Then we come home, and it seems surreal that life goes on despite the fact that we have two daughters at the hospital. Sometimes I still put my hands on my tummy, forgetting that my babies now are doing their kicking and growing at the hospital three miles across town. Big sister E visits them too, bringing books to read to them and making up little songs about Sylvia and Carina. She tells me she wants them to come home, and I blink back tears and tell her that I want them to come home too, but they have to get bigger and stronger first. Often we see other families leaving the hospital with their newborns, loaded down with balloons and flowers. I’m jealous of them- and I’m sad for Sylvie and Carina that their arrival wasn’t heralded with pure joyful congratulations and balloons, but instead with fear and worry from those who love them best. It took us a week before we even started telling friends and family (other than our parents) that they had arrived. But I can’t feel sorry for myself or for them for too long when I see the determination of my daughters to keep breathing and growing. Every day I’m inspired by their strength. Watching their feisty little spirits as they kick and pull on their CPAP masks, putting up a fight when they want to make their voices heard. And despite “Dr. Doom’s” prognosis on their second day of life, both girls continue to make steady progress. Sylvie came off oxygen first, just a few days after birth. Carina needed the ventilator for the first day, but then graduated to the CPAP (which is less invasive and just applies a gentle pressure to help them inflate their lungs). She was soon off the supplemental oxygen too. The doctors had talked about taking Sylvie off the CPAP this week, but decided to bump her back up to a 5 instead of 4 and give her more time to focus on growing and gaining weight instead of working too hard to breathe. Both girls are tolerating their feedings well (breastmilk by feeding tube along with an IV for supplemental lipids and nutrition) and are almost back to their birth weights. So all good news so far, which is a rare thing on the NICU rollercoaster, and especially given Carina’s scary start which I try not to dwell on. Last time I posted, I promised pictures. Here are the girls at one week old, without all their CPAP breathing gear. Both are less than three pounds. Though tiny, they are such bundles of strength, sweetness and determination. Thank you all for your positive thoughts, wishes and prayers over the past month and a half. You have helped me find strength I didn’t think I had when I needed it most. I’ll continue to keep you updated about the girls you’ve helped so much- at least until they are safely home. Tuesday, August 12th started like most good boring days of bed rest should. Early morning vitals and monitoring, horrible hospital breakfast, “Non-stress test” for an hour where both babies heartbeats looked perfect, within range and with good accelerations and deceleration. I had my usual bi-weekly ultrasound scheduled for 1pm, and the hospital transport was 40 minutes late coming to pick me up. I hadn’t had time for lunch before I thought they would arrive, so I was grumpy and hungry. In the ultrasound, the technician looked at Baby A first. Not surprisingly, Baby A’s fluid levels were low. I had been loosing more fluid than bleeding over the past two weeks. The doctors though this was preferable to bleeding, explaining that the babies didn’t need as much fluid later in the pregnancy anyway. So I wasn’t too concerned. Baby A also didn’t do her practice breathing- which I understood was normal not to do it every time. She and Baby B rarely both got scores for breathing on the same day, and I was certain I had felt Baby A hiccuping just before the ultrasound (hiccups also count for the breathing score.) But all this meant that Baby A got a score of 4/8 while her sister was 8/8 for the biophysical. Transport wheeled me back to my room, and I finally ordered lunch and ate at 4pm. The nurse came in and said the doctors saw Baby A’s scores, and wanted me back on the monitors to do another Non-stress test. I was annoyed. If they were worried about the biophysical ultrasound, it seemed like the doctor on call should at least talk to me about the results. On the monitor, Baby A’s heartbeat looked high, staying around 170 and up, occasionally dropping down to the high 160’s. The TOCO monitor also showed contractions every four minutes, though I wasn’t feeling anything other than what I thought was indigestion from my late lunch. I’m now so grateful that the doctor on call thought otherwise. Orders were sent down for me to be transferred to Labor and Delivery. I was upset. None of this seemed cause for alarm- and I knew what the routine would be in Labor and Delivery: Magnesium, hooked to the NST monitoring and an IV all night, lots of people coming in and out of the room, and no sleep. It was 5pm. I told T to come to the hospital. T, said later that he knew when I said to hurry, that this was serious. He left his office and flagged down a cab. Stuck in traffic on the short drive to the hospital, he told the cab driver to do whatever she could to get him to the hospital as fast as possible, explaining our story. Sometimes life is stranger than fiction; the cab driver who picked T up was born prematurely at 30 weeks herself at another hospital in town. With a twin sister who didn’t survive. She refused to take T’s payment for the cab ride, but gave him her card asking T to let her know how things turned out. When T arrived, I was deep into the magnesium haze, begging for water or ice. I wasn’t allowed anything. The nurses gave me some oxygen to slow my heart-rate, but soon I was vomiting, and then my temperature spiked as I started shivering uncontrollably, my whole body writhing in pain with how cold I felt. I heard the nurses saying the babies’ heartbeats were high. Through my haze, the doctor calmly told me that I had a serious infection from Baby A’s water breaking, and that we needed to have an immediate c-section to the babies out. I cried, but agreed. I knew I could no longer keep the babies safe inside. I could only hope they were ready. T called my parents, 3,000 miles away, to let them know what was happening. “Remember to be excited,” my mother said. “This is your babies’ birthday!” Her optimism was just what I needed to hear. By 7pm, the nurses were wheeling me into the operating room. I clung to T’s hand, pressing it to my face, the only bit of warmth I could feel as my body continued to shudder uncontrollably from severe chills. It was even colder in the operating room. With all the strength I had left, I willed myself to stop shaking long enough for the anesthesiologist to inject the spinal pain blocker. I felt the pressure of the incision, and at 7:33 pm, they announced that Baby A was out. My heart fell as I strained to hear her cry. No sound at all. They whisked her into the recovery room and I felt another weight being lifted out of me as her sister was delivered two minutes later at 7:35 pm. Again, no cry and she was whisked away, not even a moment to spare for me to see her. I told T to go with the girls, where he was allowed to watch them in the recovery room. Meanwhile, I was shivering even more violently as the surgeon was still trying to remove the placentas. The doctor later told me that did his best to stay calm, but he was very worried as my vital signs were failing and my blood pressure was dangerously low. They were placing another IV, trying to stabilize me, promising me a warm blanket as soon as they could get the second IV in. Even with the warm blanket, I was so cold, my body so stiff. The first placenta came out easily, but I heard the surgeon say that the other placenta wasn’t budging. I assumed this must be the previa placenta, which has a risk of being a placenta accreta. This means it grows into the uterus which was very dangerous and would need an emergency hysterecomy. Another worst case scenario seemed to be coming true. Later I learned it was Baby B’s placenta that was just wedged in at an odd angle, and they got it out. From here, it was a haze. I don’t remember them stitching me back up, only vaguely remember them rolling me back to my L&D room. The warmth gradually started to return to my body. They wheeled in Baby B so I could see her. She was so tiny and beautiful, and seemed calm despite what she had just been through. They assured me she was doing well. 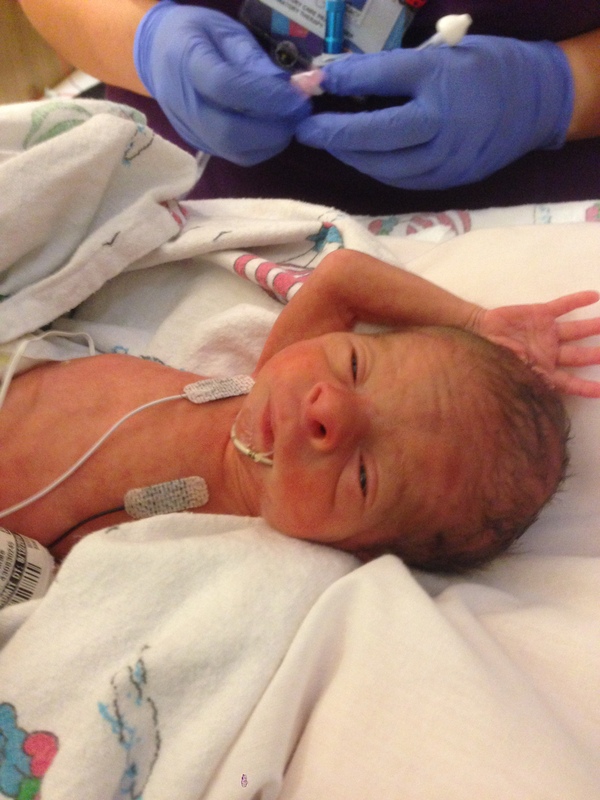 They told me that she was smaller than her sister, just 2 pounds 7.5 ounces while her sister with the compromised placenta and amniotic sack was surprisingly much bigger at 3 pounds 5.6 ounces. I was afraid to ask where my other baby girl was. T came in from the baby recovery room. Looking at his face I knew it wasn’t good news. He told me she was fighting hard, but she was struggling. He bowed his head so I wouldn’t see how scared he was, but he was crying. “Go be with them,” I told him. I felt numb. This couldn’t be happening. I will always be so grateful for my nurses who took things into their own hands and decided I needed to see my baby girl. As soon as they confirmed I was stable, they wheeled my hospital bed down the hall and up to the NICU. It looked like a party in our room- a huge crowd of people and all the lights on. Everyone surrounding the isolette where my daughter was. I overheard the doctor telling my husband that they had tried all the ventilators, that she was refusing them all, that she wasn’t breathing on her own or taking in the oxygen she needed with the support. The last resort was to administer nitrogen oxide, something they didn’t usually use on preemies, due to the risks of bleeding. It was a “Hail Mary” approach at this point. I’ve never seen T look so shaken. My nurses wheeled my bed in right next to my daughter’s isolette. I expected to see her lying there, limp and motionless. To my surprise, she was kicking her feet and waving her hands around. My husband was right- she might be struggling, but she was fighting hard. The nurses opened the door of her isolette and encouraged me to reach in and touch her, to talk to her. It hit me that this might be the only time I would see her, the first and last time I might hold her hand. Tears streaming down my face, I reached in and stroked her tiny arm gently, holding her little hand and told her how much her daddy and I loved her. How she had a wonderful big sister who couldn’t wait to meet her. How much her little twin sister needed her. How loved she was. How she had to hang in there, that we all needed her. T came over and we held each other and cried. “I’m so proud of her- she’s fighting so hard,” he said through his tears. The nurses took me back down to my room, leaving T behind with our daughters. I was dazed and exhausted. I started to pump milk, getting only a few drops, every few hours, but feeling good that there was still something I could do for them. Each time I dozed off I’d wake with a start when I heard the door open, afraid someone was coming in with the news I feared to hear. T came back to let me know that the doctors were able to place the ventilator. He was going to sleep in the NICU room with the babies, and he’d let me know if anything changed. When T came in the next morning, I could see the exhaustion in his face, but it was mixed with relief. He brought me across the hall to the NICU to see our tiny babies. Our tough little girl had made it through the night and was holding steady on the ventilator. The NICU doctor was standing by her isolette, explaining that they were already starting to turn down the nitric oxide and supplemental oxygen. That if all continued to go well, our tough baby girl would soon be exubated and moved to the less invasive CPAP instead, which just exerted gentle air pressure to make breathing easier. Our youngest daughter was continuing to do well, sleeping as peacefully as she had the night before, letting her twin get all the attention she needed. We began to let ourselves relax a little bit. We marveled over their tiny toes and fingers. Their matching dark hair. Most of all, their incredible determination to be here. Yesterday we finally decided on names, choosing middle names from each of our families and first names that were all their own. I’m so grateful to be able to introduce them to you all: Sylvia Grace (Sylvie, meaning from the woods in Latin) and Carina Eleanor (Carina meaning dear little one in Italian.) Grace after my great-grandmother and for all the grace she had coming into the world so early but so calmly, allowing her sister to get all the attention she needed in those critical hours. And Eleanor for T’s grandmother who died when he was very young, who was always said to be his guardian angel. The nurses in the NICU already have commented what little personalities they are. That Sylvie is the talker and Carina is the active one. We held them today for “Kangaroo” time- the girls were calm and seemed happy snuggling in warm and cozy against us. All the wires seemed to disappear for that moment, and T and I finally were just parents holding our babies. It felt wonderful. I get to go home today. It seems surreal, that I’ll be home for the first time since July 10th, sleeping in my bed with T, playing with E and walking around without the constant worry of my difficult pregnancy. My bed rest marathon is over, but we are just beginning the NICU marathon. Our girls as well as T and I need to stay tough, and once again, take it just one day at a time. While I still wish I could have protected them for longer, our little Carina Eleanor knew that she and her sister needed to come out that day. I also wish this was the end of our story; that I could wrap it up here with a happy bow. 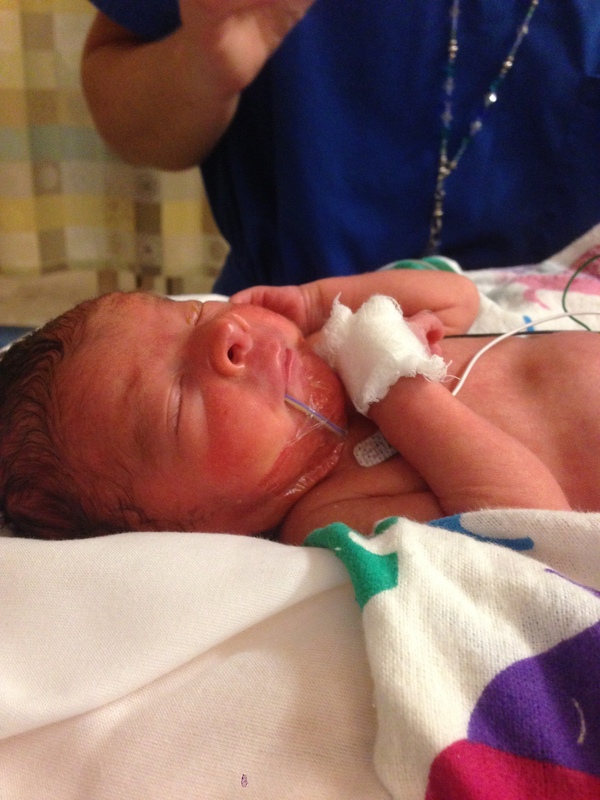 But as the doctors like to remind us, there are no guarantees in the NICU. Thanks to you all for your love and support through all these chapters; through the long struggle with infertility to my hospital bed rest pregnancy and now the NICU. I’ll continue to share updates here about Sylvia and Carina. And hopefully one day, the happy ending to our story. PS: For everyone who is hoping to see a photo- forsome reason, WordPress is not allowing me to post photos. I’ll try and share one later.